The global Automotive Fuel Cell Market was estimated over 5, 000 units in 2015. It would grow at a CAGR of nearly 13% in the forecast period (2016-2024). The market can reach over 10, 850 units by 2024. Expansion across fuel cell vehicles or FCVs owing to pollution-awareness will drive the industry in the near future. FCVs or fuel cell electric vehicles (FCEVs) run primarily on hydrogen. About 80 million tons of hydrogen are generated each year to cater to the demand for hydrogen fuel cells in FCEVs. Hydrogen infrastructural developments are the key market propeller. In 2015, the transportation sector largely contributed to carbon dioxide emissions in the U.S., adding to the greenhouse gas problem. The use of FCEVs may curb pollution. 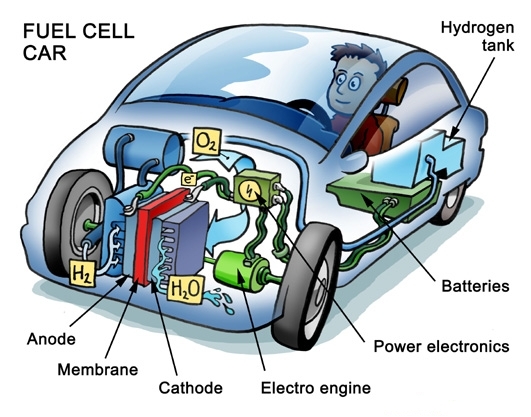 A fuel cell contains electrodes. It converts chemical energy into electrical through electromechanical reactions. Electrolytes move electrically-charged elements from one electrode to another, speeding-up chemical reactions in cells. Biogas, natural gas, and other alternatives are used in fuel cells. This aids in reducing & eliminating noise & air pollution, as hydrogen in combination with oxygen, creates water. FCEVs are free of combustion during energy production. Low corrosion and lack of ‘high operation temperature’ owing to the absence of combustion are likely to boost the longevity of vehicles. This coupled with their lower maintenance costs can add industry growth. Research & development (R & D) activities should create business opportunities, leading to more employments. High costs of automotive fuel cells are predicted to hamper the industry. Moreover, lack of technological advancements can hinder the industry. The Automotive Fuel Cell Market is split into applications and regions. Applications include light-duty vehicles and materials handling. The former accounted for over 50% of the worldwide consumption in 2015. It will also dominate during the next eight years. Many vehicle manufacturing firms have begun running ‘automotive fuel cell’ programs to encourage technological advancements. Light duty vehicles would grow at around 12.5% CAGR from 2016 to 2023. Their growth should be attributed to technological innovations and their reducing costs. Materials handling is projected to witness a CAGR of about 15% in the near future. Its applications across airports, distribution centers, and inventory management can contribute segment expansion in the eight years ahead. In addition, minimal operating costs and low-needed maintenance of these cells can raise market incomes. Regions encompass North America, Latin America, Europe, Asia Pacific, and the Middle East and Africa (MEA). Asia Pacific led in terms of demand, capturing over60% of the total volumes in 2015. It is anticipated to display significant growth accredited to regional support on product promotions. Europe may surface as a key region. To commercialize fuel cell technology, the U.S. Department of Energy (DOE) rewarded over USD 7 million in 2013. Due to constant assistance from the U.S. DOE, private firms, & national laboratories; the Automotive Fuel Cell Market has noticed upward trends in the last few years. The worldwide market is highly competitive and characterized by numerous large players and small & medium-sized enterprises. Major competitors are Toshiba, Panasonic, Ballard, Plug Power Inc., and Acumentrics SOFC Corporation.